The video is pretty graphic. Qing Qing and Ha Lei tangle and slither about awkwardly on the floor of their panda enclosure. 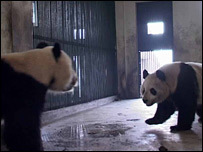 Their encounter is filmed by one of the keepers. And scientists at the Chengdu Research Base for Giant Panda Breeding now play this mating tape to other pandas in the hope that it will encourage them to do the same. "Here you can see the female is very co-operative," says reproduction specialist Hou Rong - who is known here as the Goddess of Fertility. She watches the video closely. The two pandas writhe about for a bit longer. Then they untangle. It may be best to stop male pandas from watching what comes next. "The female is not co-operative," says Dr Hou laconically. The tape shows the female, Qing Qing, attacking the male, Ha Lei. He runs off to the corner, looking sheepish. Qing Qing looks angry. 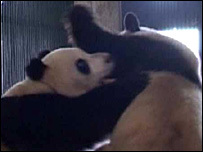 Apparently this is normal behaviour for pandas after mating. Still at least Qing Qing and Ha Lei get their job done. That is quite something. Some species cannot seem to stop mating, but pandas cannot seem to start. Female pandas are only interested in reproducing for two or three days a year. For males it is the same. Luckily for the survival of the panda species, these days of interest happen to coincide. Scientists here have to make the most of this brief mating season. There are only around 2,000 pandas left in the world - including about 250 in captivity. So the trick for everyone here at the Chengdu reserve is to get their pandas together on the right days, and then nudge them along a bit by playing them the video of Qing Qing and Ha Lei. No one here can remember who came up with the idea - it was possibly a behaviour specialist from abroad, they say. And there is one problem - no one is sure whether or not the mating tapes make any difference. "We don't know if its useful for pandas or not," says Dr Hou. "Some pandas are interested. Others are not interested. They prefer to eat or rest - and not pay attention to the video." So the reserve lets us play the video to the pandas ourselves. We get together a small monitor and some loudspeakers, put some plastic bags onto our shoes and head into a small enclosure. One panda lies on its back among piles of bamboo leaves. Another is asleep. It does not look like they have mating on their minds. We set up a small TV screen in front of a seven-year-old female panda called Shu Qing. She is busy crunching her way through an apple. We play her the tape of Qing Qing and Ha Lei. Shu Qing shows no interest. She is much more concerned about finishing her apple. After a couple of minutes she glances over at the TV monitor. Then she seems lost in thought. She vaguely waves a paw, but nothing more. So the video does not appear to work. Perhaps Shu Qing has a headache, or perhaps she just prefers apples to adult videos.